What is the best metal 3D printer in 2019? In this article, we’ve compiled a comprehensive overview of the top metal 3D printers that are available on the market today, as well as general information regarding metal additive manufacturing. For those looking for more affordable additive manufacturing solutions, we also have an article on high-temperature PEEK 3D printers for high-performance materials. 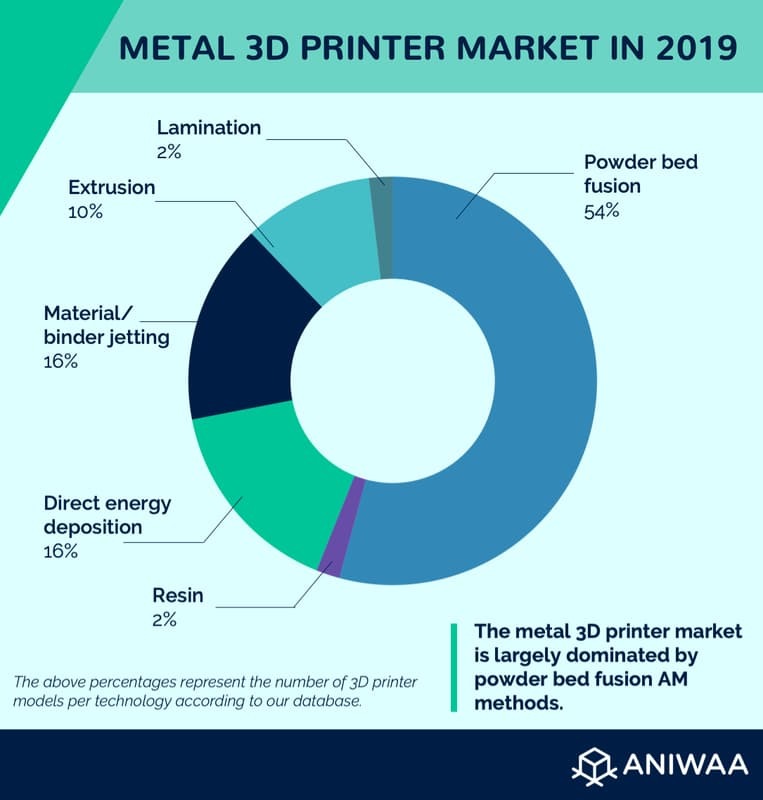 Many professionals and industrials are adopting metal 3D printing technology to create metal 3D printed prototypes or customized parts on demand. Metal 3D printers are relatively expensive, mostly ranging from $80K to almost $1M. They are suitable for many industries such as aerospace, automobile, health, engineering, and more. In some cases, however, investing in a heavy industrial 3D printer may not be cost-effective. Apart from the high cost of acquisition, there are also high maintenance and energy fees, in addition to the large footprint that most industrial additive manufacturing systems require. Another factor to take into account is the learning curve regarding 3D printing technology. The above table is an extensive view of metal 3D printers available on the market. Use the arrows to see all the metal additive manufacturing systems. Most of the manufacturers in this table have many other metal 3D printers in their portfolio, but we chose to select only one metal 3D printer per brand in this article. *Technology: the listed technologies are general categories of 3D printing methods. Each manufacturer has their own variation or proprietary technology. **Price: the majority of prices in this table are price ranges. These can vary over time and/or from one country to another (import fees, taxes, etc.). Note: see all the metal 3D printers available from each manufacturer and compare up to three of them side-by-side with our 3D printer comparison engine. At the moment, the most commonly used metal additive manufacturing technology is powder 3D printing. Simply put, the 3D printer creates objects out of a bed of powdered metal thanks to a powerful laser. Find more information about powder additive manufacturing methods in our 3D printing technology guide. 3D Systems is a leading global 3D printer manufacturer that provides different types of industrial-grade additive manufacturing systems. They acquired Phenix Systems in 2013, a French company, for the ProX DMP 300’s direct metal 3D printing method. The Additive Industries MetalFAB1 uses four full-field lasers to sinter metal powder material. It features automated powder handling and a large build volume. Arcam is owned by GE Additive, General Electric’s 3D printing department. The Arcam Spectra H EBM (Electron Beam Melting) 3D printer features automatic powder management and laser beam calibration. The AddUp FormUp 350 metal 3D printer. The FormUp 350 is an industrial metal 3D printer from France. This powder metal 3D printer uses LBM (Laser Beam Melting) 3D printing technology. One of the FormUp 350’s interesting attributes is its open material compatibility. The Aurora Labs S-Titanium Pro is available with three different metal 3D printer methods: SLM, SLS, and DED. It is compatible with a wide range of metals and is one of the most affordable metal powder 3D printers on the market (around $50K). The ADIRA AddCreator boasts a very large build volume of 1000 x 1000 x 500 mm. This metal 3D printer sinters powder in different segments, a process that the manufacturer calls Tiled Laser Melting (TLM). CoLiDo usually targets the mass consumer market but, with their AMSS Metal 3D printer, this Chinese manufacturer is aiming for small businesses and start-ups. Concept Laser, a GE Additive company, uses their LaserCUSING powder sintering technology. The entire metal 3D printing process is free of oxygen to avoid contaminating the material. The Concept Laser M2 Cusing metal 3D printer. The DediBot DS2-MIX 3D is a metal laser melting 3D printer from China. This metal additive manufacturing system is capable of 3D printing various metal powders at a time. The DMG Mori LASERTEC 30 SLM is a powder sintering AM solution from Germany. This industrial 3D printer boasts an automated powder management system and is compatible with third-party materials. This EOS direct metal 3D printer uses Direct Metal Laser Sintering (DMLS) 3D printing technology. 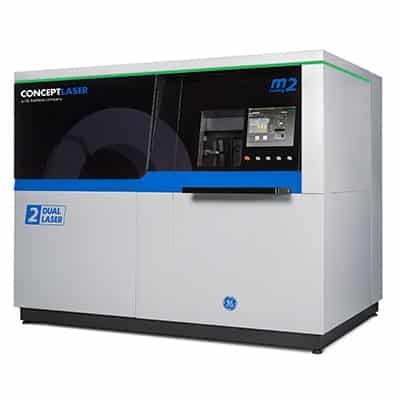 The M 100, developed in Germany, is an entry-level metal additive manufacturing solution for industrial use. The Matsuura LUMEX Avance-60 is a Japanese hybrid manufacturing solution; it is capable of sintering powdered material as well as milling parts with its CNC mill. With the LUMEX Avance-60 it is possible to 3D print parts of up to 1,300 kilograms. Renishaw is a British engineering company. The RenAM 500M is one of their additive manufacturing systems which uses the SLM (Selective Laser Melting) 3D printing method. Shining 3D is a Chinese 3D printer and 3D scanner manufacturer. Their EP-M100T metal SLM 3D printer features a small build volume (120 x 120 x 80 mm) ideal for small parts and prototypes in the dental or jewelry industries. The Sodick metal 3D printer. Sodick is a multinational additive manufacturing company with their headquarters based in the US. 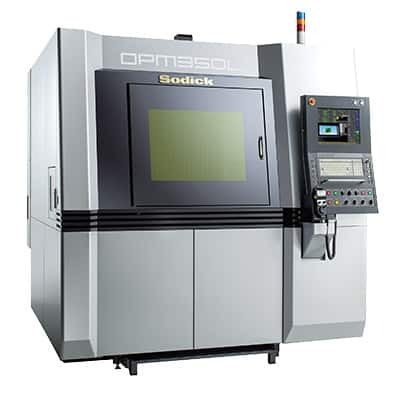 The Sodick metal 3D printer OPM350L uses a combination of laser sintering and CNC milling to produce metal parts. The Sisma MYSINT100 is an Italian 3D metal powder printer that uses Laser Metal Fusion technology to 3D print metal parts. The MYSINT100 is compatible with a wide range of metals, including precious metals. The SLM Solutions is a 3D printer manufacturer from Germany. Their SLM 500 HL features a wide build volume of 500 x 280 x 325 mm. The Velo3D Sapphire is a high-volume metal 3D printer from the US designed for production series. This metal 3D printer features Velo3D’s Intelligent Fusion technology, enabling complex geometries and overhangs. Wiiboox is a 3D printer manufacturer from China that targets consumers, professionals, and industrials. The Wiiboox SLM150 is a small-volume (120 x 120 x 80 mm) industrial metal 3D printer. The Xact Metal XM200C targets small and medium-sized businesses as it is relatively affordable ($80K) for a powder metal 3D printer. 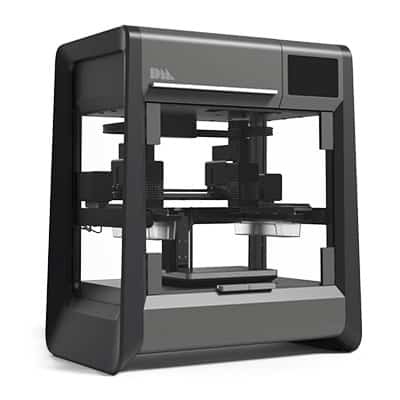 It features an onboard camera for users to monitor the 3D printing process. The TRUMPF TruPrint 1000 LMF metal 3D printer. Founded in Germany in 1923 as a mechanical workshop, TRUMPF is now a leading machine tool manufacturer. 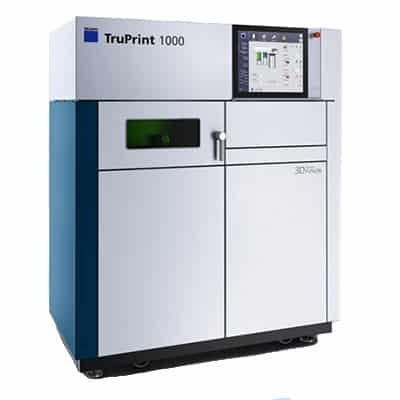 Their TruPrint 1000 metal 3D printer features Laser Metal Fusion (LMF) technology. ZRapid is a company from China that manufactures a wide range of 3D printers with different technologies. The SLM300 can 3D print with stainless steel, aluminum, titanium, and copper powders. Material jetting 3D printers consist of various inkjet printheads (somewhat similar to 2D printing) that jet material onto a surface. The material then hardens, and another layer of “metal ink” is jetted on top. Binder jetting is almost the same process, but it is a binding agent that is jetted atop a layer of powder. Find more information about material jetting and binder jetting additive manufacturing methods in our 3D printing technology guide. Digital Metal is part of the Swedish Höganäs Group. The DM P2500 offers users a very high-resolution of up to 0.035 mm and medical-grade finishes. This metal additive manufacturing system is suitable for production series and end-use part customization. The ExOne S-Print’s binder jetting technology works with metal, ceramic, and sand materials. This metal 3D printer’s main application is the creation of complex molds and sand cores. The LightSPEE3D boasts a unique, cost-effective technology that it enables it to 3D print metal without heat being applied. This metal AM system blasts metal particles at supersonic speeds, 3D printing up to 100 grams per minute. The Vader Systems Polaris melts metal wire (alloys, bronze, copper) at 1200°C to then jet the material layer by layer. The manufacturer calls their proprietary liquid metal 3D printer technology “Magnet-o-Jet”. The XJet Carmel 1400 is compatible with both metal and ceramic materials in nanoparticle form. These nanoparticles are mixed with XJet liquid which evaporates as the Carmel 1400 jets the material via thousands of nozzles at 300°C. Directed Energy Deposition (DED) is comparable to filament extrusion. The metal material is pushed through a special nozzle, like FFF/FDM, but a powerful laser beam solidifies the material at its deposition point. Find more information about the DED additive manufacturing method in our 3D printing technology guide. The BeAM Modulo 400 is a 5-axis metal deposition 3D printer that is suitable for small production series as well as for adding material to existing parts. BeAM is a French metal 3D printer manufacturer. Formalloy’s L-Series metal 3D printer is suitable for laboratory applications such as material development. The L-Series uses Laser Metal Deposition (LMD) technology in combination with a blue wavelength laser. InssTek is a South Korean manufacturer. Their InssTek MX-600 uses Direct Metal Tooling technology to 3D print up to three different powder materials at a time. The Optomec LENS 860 Machine Tool Systems is a series of US metal additive manufacturing systems that uses Optomec’s proprietary LENS (Laser Engineered Net Shaping) technology. These metal 3D printers come with or without a CNC mill for hybrid manufacturing. The Sciaky EBAM 300 Series is an Electron Beam Additive Manufacturing system. This metal 3D printing machine is capable of 3D printing up to 20 pounds of metal per hour. Extrusion consists of heating the material (filament) and pushing it through a nozzle. In the metal 3D printing case, the filament is generally made up of metal particles mixed with a binding agent. After the part is 3D printed, the result is a raw object or part; it must go through debinding and sintering post-processing to attain its final form. Find more information about FFF/FDM/extrusion additive manufacturing methods in our 3D printing technology guide. The Desktop Metal Studio is a metal extruder 3D printer. This Desktop Metal 3D printer comes with a debinder module as well as a furnace for post-processing raw metal parts. Desktop Metal calls their technology “Bound Metal Deposition”. 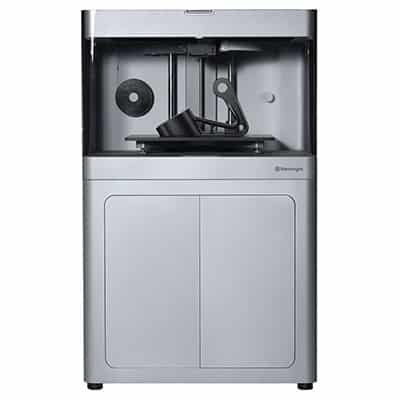 The Studio Desktop Metal 3D printer (complete system) is available at the price of $120,000. Desktop Metal also manufactures the Desktop Metal Production, a high-volume metal 3D printer for production series with Single Pass Jetting technology. The Desktop Metal Studio 3D printer. The MarkForged Metal X metal 3D printer. The MarkForged metal 3D printer Metal X uses ADAM (Atomic Diffusion Additive Manufacturing) technology and is priced at $99,500. It uses a special filament in which metal rods are embedded in plastic. This plastic is removed when the final part enters the metal 3D printer’s heating module so that only the metal material is left. The EVO is a desktop metal 3D printer that extrudes 90% 316 stainless steel filament from BASF. This desktop metal 3D printer features a dual extruder to 3D print two different materials simultaneously. The Airwolf 3D EVO, at $7,995, is one of the cheapest metal 3D printer solutions available on the market. The ExAM 255 metal 3D printer by German manufacturer AIM3D is able to 3D print a wide variety of materials thanks to its pellet extruder. Their technology, Composite Extrusion Modeling (CEM), is cost-efficient as it is compatible with common and widely-available pellets. The EVO-Tech EVO-Lizer is able to 3D print metal thanks to FMP (Filament Metal Printing) technology. This professional desktop metal 3D printer is also compatible with high-performance engineering thermoplastic filaments. Pollen AM is a French 3D printer manufacturer. The PAM Series M is a metal FDM 3D printer that extrudes metal pellets instead of filament. 3d-figo’s FFD 150H is a desktop metal 3D printer from Germany. First, the FFD 150H 3D prints a green (raw) part. Then, the part must go through debinding and sintering post-processing steps. The FFD 150H is able to 3D print with ceramic and metallic materials. This low-cost metal 3D printer is available at around $5,000. The iro3d desktop metal 3D printer from the US features a build volume of 300 x 300 x 100 mm and its minimum layer thickness is 0.3 mm. Iro3d’s metal 3D printing technology is called Selective Powder Deposition (SPD) and allows 3D printing with various metal powders: high-carbon steel, copper-iron, and copper-nickel. For less demanding use cases, it is possible to use exotic filaments which contain a small percentage of metal, like ColorFabb’s BronzeFill. They are less complex to extrude as they are often mostly made up of PLA and are compatible with most basic desktop FFF 3D printers. These exotic metal filaments offer the appearance of metal, but obviously do not boast the same properties as full-metal 3D prints. Nevertheless, they do require users to fine-tune their 3D printer’s settings in order to obtain good results. There are very few other metal printing technologies available on the market. Some use resin 3D printing (SLA/DLP) and its variants to 3D print metal. Photosensitive resin is filled with metal particles, and a laser (SLA) or light projector (DLP) hardens the material, layer after layer. Another option is lamination 3D printing, also known as LOM (Laminated Object Manufacturing) or Sheet Lamination (SL). The 3D printed part is made up of thin sheets of material that are merged atop of one another and cut into the right shape. Find more information about the resin and lamination 3D printing methods in our 3D printing technology guide. 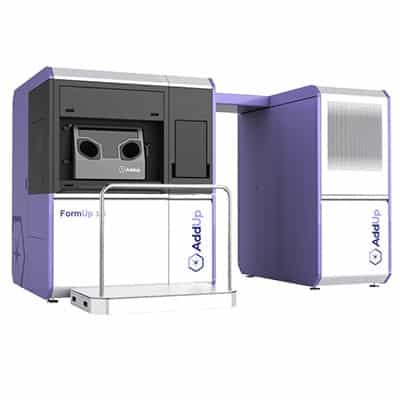 The Admatec ADMETALFLEX 130 uses Digital Light Processing (DLP) to 3D print metal-infused resin. Admatec, a Dutch manufacturer, also produces ceramic DLP 3D printers. Cytosurge is a Swiss company. The FluidFM µ3Dprinter is able to 3D print pure metal objects at the sub-micron scale with very high precision. Fabrisonic’s 3D printing technology consists of using ultrasonic sounds to merge layers of metal foil. The SonicLayer 4000 also features a CNC mill and is considered a hybrid manufacturing system. 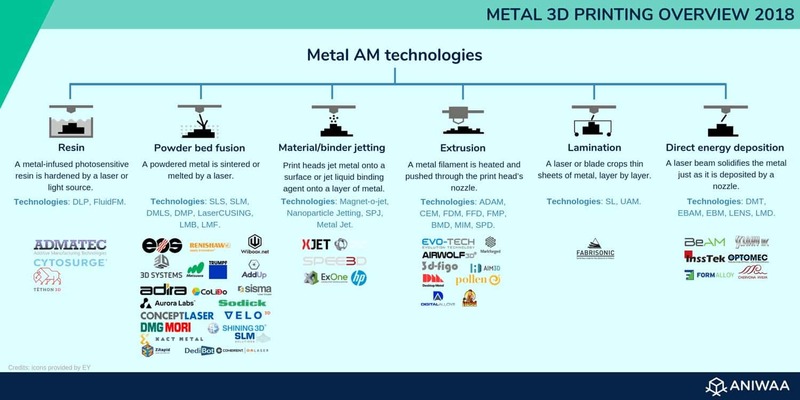 Below are a few promising metal printing methods and metal 3D printers that are still in the research or prototype phase. HP is entering the metal 3D printing market with their Metal Jet technology. Their HP metal 3D printer has yet to be commercially available, but boasts a build volume of 430 x 320 x 200 mm and will cost less than $400K. An Israeli team of university researchers has been developing, since 2015, a Localized Microwave Heating technology. The concept consists of melting voxels of metal powder via microwave irradiation and is considered a low-cost metal 3D printing method. Tethon 3D is a well-known ceramic resin material manufacturer. In collaboration with the University of Nebraska, Tethon 3D is developing a ceramic and metal DLP 3D printer: the Bison 1000. Digital Alloys’ aim is to make metal additive manufacturing more affordable, as their new Joule Printing technology is compatible with all metals in wire form, which is less expensive than metal powder and other material types. Ukrainian company Chervona Hvilya developed a proprietary EBM (Electron Beam Melting) technology that they call xBeam. It uses standard industrial metal wire as its 3D printing material. NVO Chervona Hvilya claims to prove that additive manufacturing is the world’s third Industrial Revolution. Investing in such an expensive machine requires a great amount of research and professional consulting. Here, we cover some of the basics that should help users gain enough knowledge about metal 3D printing to aid in their decision-making and assessing if metal AM is the right solution. 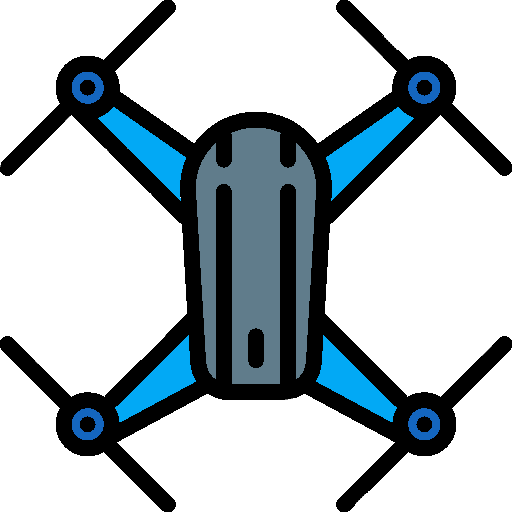 For professionals with limited office space and human resources, low budgets, and/or few needs of custom parts and prototypes, metal 3D printing services can be an ideal solution. 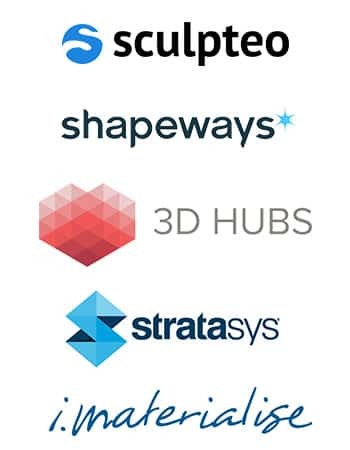 These additive manufacturing service companies own a variety of high-quality 3D printers with different technologies, and their professionals are experts in 3D printing. It is possible to order metal 3D parts on-demand, without acquiring a 3D printer or having to buy a certain material for one-time use. Metal additive manufacturing has numerous benefits but there are also limits to take into account, as with any type of 3D printing. 3D printing metals: which metals can be 3D printed? Is 3D printed metal strong? Metal 3D printed parts can be as strong (or even stronger) as metal parts created with traditional manufacturing processes such as casting. The part’s strength will, however, depend on the metal AM method used and the conditions in which it is 3D printed. Metal laser sintering 3D printers offer great strength, suitable for production series, whereas metal filament 3D printers are generally more adapted for prototypes. In any case, metal 3D printing is a very delicate process and requires an optimal environment: inert gas chamber/oxygen-free printing area (for powder material), stable temperatures, etc. When was 3D metal printing invented? Metal 3D printing became possible in the 1990s with the development of Selective Laser Melting technology. However, 3D metal printing only started to gain traction and public interest around 2010 onwards. Today, more and more industries are attracted to metal 3D printing, with companies like Desktop Metal or MarkForged democratizing this metal manufacturing method. Metal 3D printer price: how much does a metal 3D printer cost? Industrial metal 3D printer prices generally range from about $50,000 to over one million dollars for the most premium, industrial-grade metal additive manufacturing systems. More affordable solutions exist ($7,000 +), such as the Airwolf 3D EVO or EVO-Tech EVO-Lizer desktop metal 3D printers which use metal filaments to produce green (raw) parts that require heavy post-processing. Additional costs to consider are the materials for metal 3D printing (can cost a few hundred USD/kg) as well as those linked to post-processing (tools, time, etc. ).